Our Chiang Mai trekking adventures last from 2-4 days. They give you an opportunity to hike further into the hills and spend one or more nights in a hilltribe village. 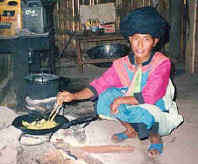 You will be able to experience and participate in the hilltribe way of life. There are groups leaving regularly for each itinerary. 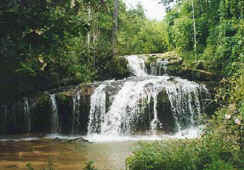 Each trek will be led by a licensed English speaking guide and accompanied by one or two porters. The area north of Chiang Mai, provides us with the opportunity to visit many different kinds of hilltribes. Our 3 day trek Phrao trek is a route we recommend to visit a wide variety of hilltribes. There's no other area that offers such a wide cultural variety. If you are short of time then try the 2 day Mae Taeng Trek which offers some lovely scenery. If you have any special requirements just let us know. Two Day Trek- Mae Taeng area (ref. TD02) Popular! Day 1 Drive north of Chiang Mai stopping at a local market and a waterfall on the way. We have lunch at a hot spring and walk for 3hrs in the afternoon, to a Karen village. We spend the night at the Karen village. 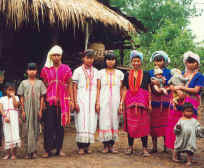 See the traditional lifestyle of the hilltribes. Day 2 In the morning, walk for 3 hours to a Karen village and stop for lunch. 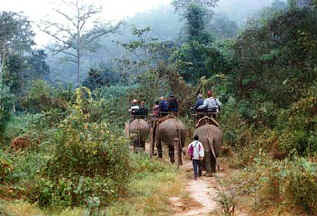 In the afternoon take an elephant safari to a Lahu village. The elephant safari lasts approx. 2hrs and we spend the night in the Lahu village. Day 3 In the morning leave the village for a rafting trip down the Mae Taeng River. Rafting down the river lasts for approx. 2 hours. Stop for lunch and a short break, then drive back to Chiang Mai. Day 1 Drive north of Chiang Mai for approx. 2hrs, stopping for lunch along the way. In the afternoon drive up to the Lisu village, where we start trekking. Walk for approx. 3hrs. to an Akha village, stopping at a waterfall along the way. Overnight at the Akha village. Day 2 Walk for approx. 2½hrs. and stop for lunch at a Lahu village. 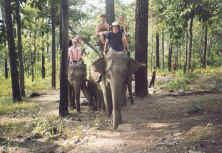 In the afternoon, take a ride on the elephants for approx. 2hrs, arriving at a Palong village. Overnight at the Palong village. If you would like to reserve a place on one of these treks or just make an enquiry. Then just use our Enquiry Form or E mail us and we will get back to you within 48 hours. Copyright © 1998-2017 Sarah Guesthouse Chiang Mai All rights reserved.